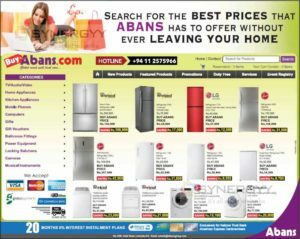 Nation Trust American Express Credit card announces a special promotion of discount upto 20% at Abans on your every purchase and enjoy 20 months interest free installments. 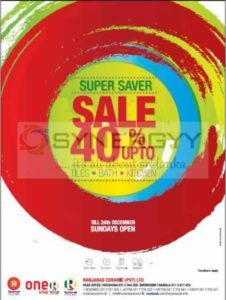 Ranjanas Ceramic announces special promotions as discounted prices with 40%off for tiles, Bathroom and kitchen tiles till 24th December 2016. 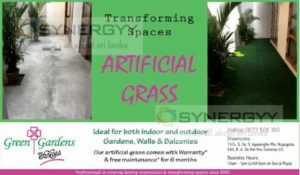 Ideal for both indoor and outdoor Gardens, Walls & Balconies with green garden artificial grass comes with Warranty* & free maintenance* for 6 months. Artificial grass brought you the comfortable of less maintenance and avoid muddy floor in raining seasons. This artificial grass brought you easy clean and highly durable compare to natural grass. 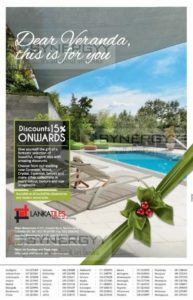 Lanka tiles a leading tile manufacture and importers in Sri Lanka brought you an excellent seasonal discount of 15% for their range of collations of Concrete, Wood, Crystal, Essential, Senses and many other collections in every colour, texture and size imaginable. It’s a time to give yourself a gift of a fantastic selection of beautiful, elegant tiles with amazing discounts. 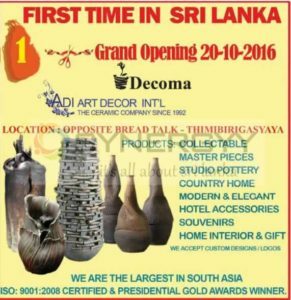 Jawatte Showroom: # 133, Jawatte Road, Colombo 05. 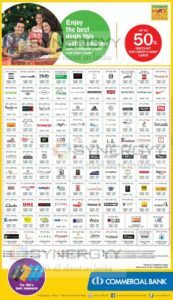 Art of Living Brought you an unmatched promotion of discount upto 50% for home décor, Glassware, Cutlery and Bed & Bath Linen. The offer only Valid till 22nd of December 2016 and this offer cannot be combined with any existing credit card offers. 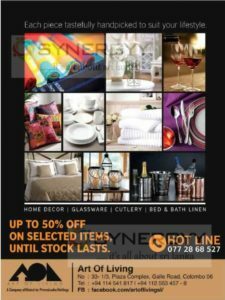 Delmege Forsyth & Co, Ltd Life style Cluster brought you a luxury vinyl planks and makes your ordinary home to classic beauty of modern designed home. Choose the perfect design to compliment your floor from our exquisite range of luxury vinyl planks with authentic wooden textures & genuine hardwood color tones to your Hotels, Offices, Residences, Apartments or Restaurants. 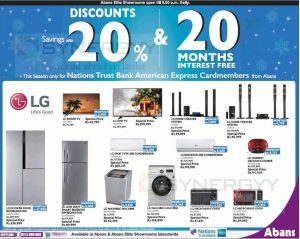 American Express Credit Card from Nations Trust Bank announces a special promotions from Abans, enjoy your seasonal shopping at Abans with American Express Credit card till 31st December 2016 and enjoy discounts upto 20% and 20 months interest free installment plan. 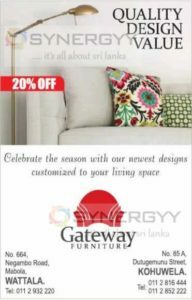 Gateway Furniture announces an attractive promotion of 20% on great designer furniture in this festive pre-season; the offer brings you newest designs customized to your living space at a very special price tag with uncompromised quality. 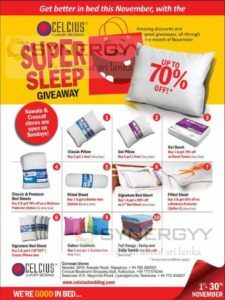 Visit to Gateway Furniture at # 664, Negambo Road, Mabola, Wattala or # 85 A, Dutugemunu Street, Kohuwela. 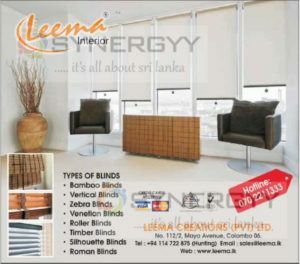 Leema Interiors Introduce range of Blinds at an affordable price for your home, office and hotels. Blinds bring you a luxury looks for your resident, office and hotels. 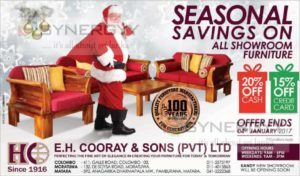 E.H. Cooray & Sons 100 years old furniture manufacture with high quality woods with lifelong serving furniture’s announces a Furniture Sale till 4th January 2017, enjoy a special prices and exciting discounts of 20% off on Cash sales and 15% off on Credit card sales on this promotional period. 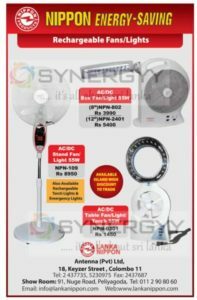 Stassen Export (Pvt) ltd an authorized dealer and distributor partner in Sri Lanka brought Duracell power to Sri Lanka at a special price of Rs. 230/-. 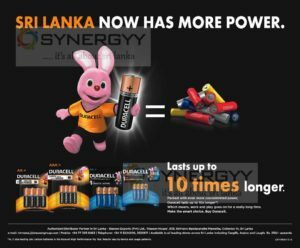 Duracell batteries well known brand in India for long lasting power now available in Sri Lanka enjoy uninterrupted works for long, Which means, work and play goes on for a really long time. Abans introduce Honeywell Evaporative Air Coolers at a special price from Rs. 21,999/- upwards. The Honeywell Evaporative Air Coolers are working to reduce temperature by using water evaporation with strong airflow at lowest power consumption as your domestic home appliance. Hunters & Company PLC announces a pre budget sale from 22nd October to 10th November 2016. 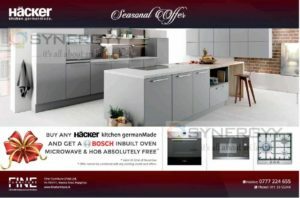 An attractive discounts available to beat the budget. 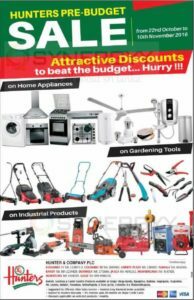 Special discounts are valid on Home Appliances, Gardening Tools and industrial Products. 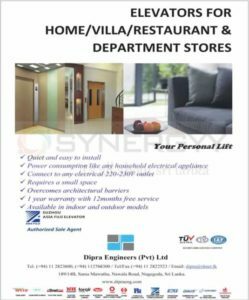 Dipra Engineers are a Sole agent for Suzhou Asia Fuji Elevators brought you latest Elevators for Home/Villa/Restaurant & Department Stores. Suzhou Asia Fuji Elevators are quiet and easy to install and Power consumption like any household electrical appliance. You can Connect to any electrical 220-230V outlet and its requires only a small space. What if you could turn your AC on before you arrive? Sure, you can save up to 60% energy on inverter type ACs but here’s the thing with Midea Inverter ACs! They do that and much more. Take Midea’s Wi-Fi feature. You can control your AC from anywhere from your mobile phone. Yes, you can cool your room before you even enter. Or if you thought you forgot to switch your AC off. you can now rest easy. Softlogic an authorized distributor for Sumsung Refrigerators announce a special promotion for Samsung top mount freezer 555 liter refrigerator just for Rs. 175,699/- only. If you like to go for 12 months installment scheme Rs. 17,503/- per month on the original price of Rs. 195,999/-. Abans brought you a Tiger Generators from Rs. 19,999/- to manage your sudden power cut when you spending a quiet evening with the family, watching a good movie or entertaining friends for a dinner. McRay Kent Pavers offering an opportunity for you to do it yourself paving at your home or office at an affordable price for a stone. 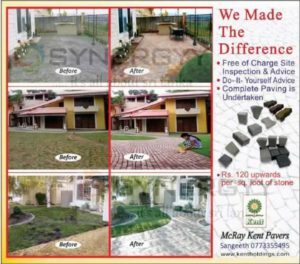 McRay Kent Pavers offer free of charge site inspection & advice for Do- It- Yourself concept and provide Advice. If you feel its difficult task with your time limitation McRay Kent Pavers would undertake complete paving at an affordable price. 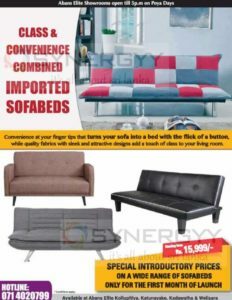 Abans announces a special introductory prices for Sofa bed starting from Rs. 15,999/- on a wide range of sofabeds only for the first month of launch. These Sofa beds are convenience at your finger tips that turns your sofa into a bed with the flick of a button, while quality fabrics with sleek and attractive designs add a touch of class to your living room. Softlogic announces a special promotion for the Panasonic and TCL Air Conditions with Discounts upto 15% and 12& 24 Months Installment schemes. Purchases Panasonic Split Standard Air Conditioner for Rs. 85,500/- after discount of 10% for the full payment or Rs. 7,125/- per month for 12 Months installment after 10% discount. Or go with next option of buy TCL Split Standard Air Conditioner for Rs. 59,499.15 after discount of 15% for full payment or Rs. 2,698/- per month for 24 Months installment after 7.5% discount.